A broken ankle occurs when there is either a partial or complete fracture in one or more of the bones comprising the ankle, namely the tibia or the fibula. The terms fractured and broken are interchangeable, as they mean the same thing medically. Broken ankles are very common ankle injuries that are often caused when the ankle rolls inward or outward. Early diagnosis is critical to ensuring a healthy recovery and healing process. Often the ankle fracture is mistaken for a sprained ankle, and treatment is postponed until the condition worsens. Breaks are much more serious than strains and sprains, and they happen in various ways. Fractures can be categorized as stress fractures, simple fractures, avulsion fractures, and comminuted fractures. Stress fractures occur when there is a crack in the outer shell of the bone. Simple fractures are a little more serious, and occur when the bone breaks completely. Simple fractures can be displaced or not. 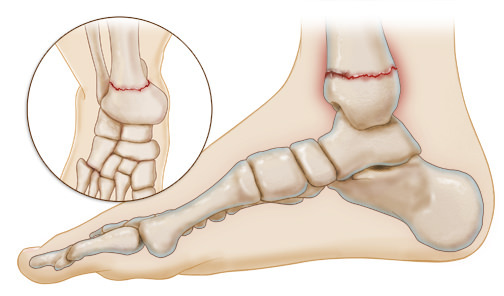 Avulsion fractures occur when a small piece or pieces of bone have been pulled off by a tendon or ligament. Comminuted fractures are the most severe, and occur when the bone is shattered into several fragments. The rule of thumb is that if a person can’t bear weight on the limb, if there is painful range of motion, or of the ankle bones is painful, then an x-ray is necessary. TIP: A broken ankle does not necessarily immobilize the victim. In fact, many people mistake a fracture for a sprain or strain because because they are still able to walk. If you are experiencing any of these other symptoms but are able to walk, you should still seek medical attention immediately to prevent further complications. How Did I Break My Ankle? Rapid weight gain may also cause a fracture in your ankle bone. For example, if you were pregnant and have broken your ankle at some time on the past, and you do not lose the extra weight or receive treatment for the previous injury, you could be causing a small fracture to enlarge. How Will a Doctor Diagnose My Broken Ankle? It is important that you see a doctor soon after you injure your ankle—waiting can make the problem worse. Your doctor will ask questions about your medical history and activities before giving you a physical exam. He or she will also order an x-ray to determine the severity and exact location of the fracture and how to treat the problem. X-rays are the most common imaging test used to diagnose this type of injury, although your doctor may also order an MRI or CT scan. How Can I Fix My Broken Ankle? You will need to be properly diagnosed before treatment for your ankle can begin. There are surgical and non-surgical methods of treatment, and your treatment will depend on the severity of the broken ankle. If the fracture is not severe, you may simply be told to use the RICE method. RICE stands for Rest, Ice, Compression and Elevation. Your doctor will also want you to stay off your injury as much as possible to ensure that it heals properly. You may be required to use crutches for a few weeks while the fracture heals. Your doctor may also prescribe you pain medication to reduce pain and inflammation. If you have suffered a moderate to major fracture, you may need surgery. When a broken ankle occurs, there is always damage to the surrounding tissues. Initial treatment for fractures includes provisionally setting the fracture, ice, and elevation of the fractured bone. Surgery, which usually involves the insertion of metal hardware, is best postponed until the swelling has gone down. In the event of a compound fracture (an injury in which the bone is sticking out of the skin), emergency surgery, antibiotics, and tetanus prophylaxis are necessary to prevent infection. After surgery, patients may be immediately mobilized or placed in a cast or boot, depending on the condition of the soft tissues and the integrity of the bone repair. For the most part, patients are advised not to put weight on the ankle for six to twelve weeks. This recuperation period is doubled in diabetic patients. To avoid muscle atrophy (the wasting away of a muscle from disuse), your doctor will want you to begin using your ankle soon after the immobilization period is over. Your doctor will advise you when and how to move and exercise your injured ankle. A small percentage of fractures will not heal with initial treatment. An unhealed fracture is called a delayed or non-union, depending upon how much time has passed. If this occurs, your doctor may need to revise the fixation and perform bone graft surgery to promote healing. During a bone graft, small pieces of bone are taken from a bone bank or from another part of your body and are placed around the break. Occasionally, doctors may use an artificial bone substitute for the graft. Electrical stimulation of the fracture is sometimes used to speed up the healing process. What Are The Complications of a Broken Ankle? Damage may occur to neighboring tissues. Broken bones may lose blood supply, causing them to die, collapse, and possibly be reabsorbed into the body. Sharp fragments of bone may compress or sever nearby blood vessels or nerves. Broken pieces of bone may begin to rejoin while still unaligned. Bones may have to be re-broken and realigned surgically. The recovery process may take longer if you do not seek immediate treatment. This can prevent you from returning to your normal activities in a timely manner. Damaging other parts of your ankle may also increase the cost of treatment. What Can I Do To Prevent a Broken Ankle? Maintain a safe home to prevent falls. Avoid slippery floors or rugs or loose stair railings, and use bathmats in tubs and showers. If you suffer from a bone disease or medical condition that affects your bones, control the condition by adhering to all treatment programs. Use seat-belts when riding in cars, and never drink or use mind-altering drugs before driving. Wear protective gear when participating in sports. During the healing process, what symptoms should I watch for that would indicate the bones are not healing properly? If this occurs, how long should I wait before contacting you again? If I do not have a bathtub in my home, how else can I bathe? Make sure you discuss any prescription, non-prescription, or recreational drugs you use on a daily basis with your doctor. This may affect the type of medication your doctor will give you to help you deal with pain, infection, or any other problems you may be experiencing.